Win an Overwatch, StarCraft, World of Warcraft, or Hearthstone T-shirt! Which is your favourite Blizzard game? There are lots to choose from and they’re all brilliant, so to help you out with this important decision, let’s reduce it to just four games: Overwatch, StarCraft, World of Warcraft, or Hearthstone? We haven’t picked those games out at random. Oh no – they’re the games that feature on the four T-shirts we have up for grabs ( as seen in the image above). They’re part of the new range of Blizzard T-shirts that are now being sold by Uniqlo. The collaboration between the game developer and clothing company kicked off in the USA recently. But now it’s really hitting the UK with the Blizzard range of T-shirts launching in the Uniqlo store on Oxford Street, London, on June 16, 2018. If you’re after more freebies then we have plenty – here are the best free PC games. If you head over to that Uniqlo store this Saturday, not only will you be able pick up the T-shirts for yourself, you’ll have the chance to win Blizzard goodies too as part of the celebrations. However, as said, we’re giving away the four T-shirts that you can see in the image at the top of this article. We have one of each T-shirt so that means there can only be four winners in total. Please also note that this giveaway is for UK ENTRANTS ONLY. We have one Overwatch T-shirt, which features D.Va; a discreet Hearthstone T-shirt; the Banshee Queen features on the World of Warcraft T-shirt; while fans should be pleased with the StarCraft T-shirt. 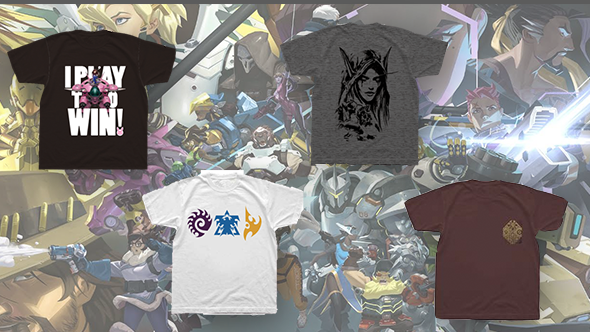 Now then, if you want to be in with a chance of winning of these top of the range Blizzard T-shirts then you need to enter the giveaway via the widget below. Every action you complete is worth one entry into the giveaway with the more actions you complete increasing your chances of winning. We’ll also need your email address so we can send you a code upon winning – we won’t send you spam, we promise. Please read ourterms and conditionsbefore you enter.